René SAMAMA, “Sam” for the family, looks very happy aboard the KAEYA. He has hit his stride since he retired and he’s looking forward to continuing as long as possible on board what he calls his “second home”. Indeed, this former company manager from Lyon takes every opportunity to raise the sails of his 12m sailing boat moored in the Port for few years now. Gybe, shroud and others sailing terms he discovered when he was a child with his uncle on board an 8.40m boat. This passion does let go more, even though the Tunisian Mediterranean is more suitable for sailing than the Rhone or the Saône rivers. Yet, one night of high winds on the Sicilian coasts, before reaching his 18th birthday, the eruption of the Etna triggers the anger of Eole. “Our sails were torn and the boat drifted onto the rocks. We were reported missing. It took us 15 days to fix the boat and return to the port where we were greeted with great enthusiasm. I remember it well and this experience taught me to be careful”. This misadventure ended well for the young skipper and did not discourage him from reaching the open sea. Only money is missing! Until he can afford the boat of his dreams, (he knows precisely what he wants) “Sam” boarded his friends ‘boat not to lose his skills until the D-day. It’s in the port of Beaulieu that the entrepreneurs from Lyon performs and that is where he wants to moor his future boat. KAEYA (contraction of Karine and Yael, Sam’s two daughters) on which Sam spends 6 months of his time the first years, meets these requirements. Boat goes hand-in-hand with mooring, and the port of Beaulieu was fully booked, “Sam” had to find another port. 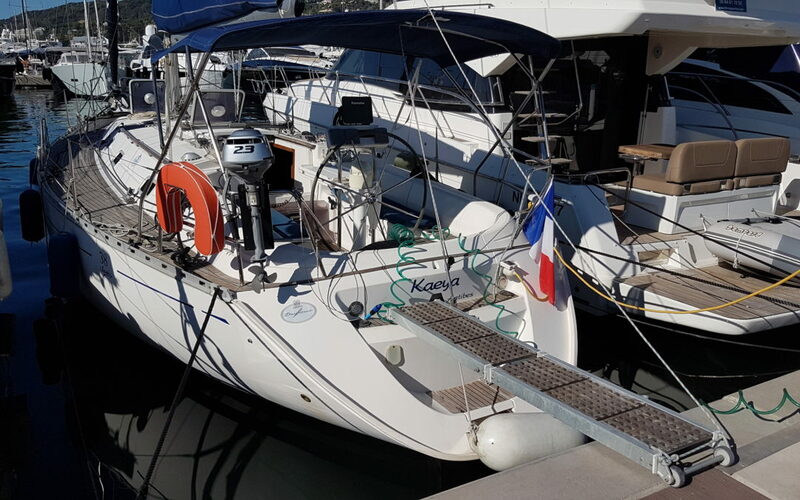 After reading a berth rental ad, Sam moved his boat to the Port Camille RAYON. “I was not too excited at first, as I found my berth too small. Afterwards I had to move berth as the owner was selling it” he says. As luck would have it, a berth becomes available on the quay 22, but it is for sale. “I did not intend to buy a berth, but the owner was, like me, from the city of Lyon.”. The negotiation between “gones” (“kids” slang for people from Lyon), has been facilitated and this is how KAEYA settled on a long-term basis in the port Camille RAYON. Now, Sam and his partner chose the months of May and September to enjoy the “KAEYA”, 2 quiet months, ideal to navigate. However, Sam would like to suggest some improvements for the comfort of all boaters of the port, such as a better WI FI access, a water dispenser, laundry facilities and why not bikes so the boaters can go easily shop around the port. It’s a legitimate question as “Sam” has no intention to go in another port of the French Riviera.